Typically, as time moves forward, the easier it becomes for many events that have thus far defined the world, to recede into the past and out of quickly retrieved memory. The reality of this pattern is something that plagues human existence for better or worse; particularly when events of the present inspire thoughts of something with direct parallels. One would assume noticing such a deep degree of similarity would encourage humanity to put forth more effort into retaining cognizance of history rather than only seeking it out as a knee jerk reaction to something happening in a current moment. Then again, it’s difficult to recall every minute detail over hundreds of years. Thankfully, whether initially intentional or not, the scholarly musicians of Public Service Broadcasting have made finding motivation to remember history quite a bit easier over the past several years. After all, what could make complex world events more fascinating than a good electronic hook and some captivatingly danceable drumming? Starting in the far reaches of space in 2014 and moving to the intimate coal mines of Wales in the summer of 2017, this history sampling trio have now set sights on the high seas, one of the most famous vessels to sail them, and one of the most tragic nautical events ever to take place: The rise and fall of the R.M.S. Titanic. 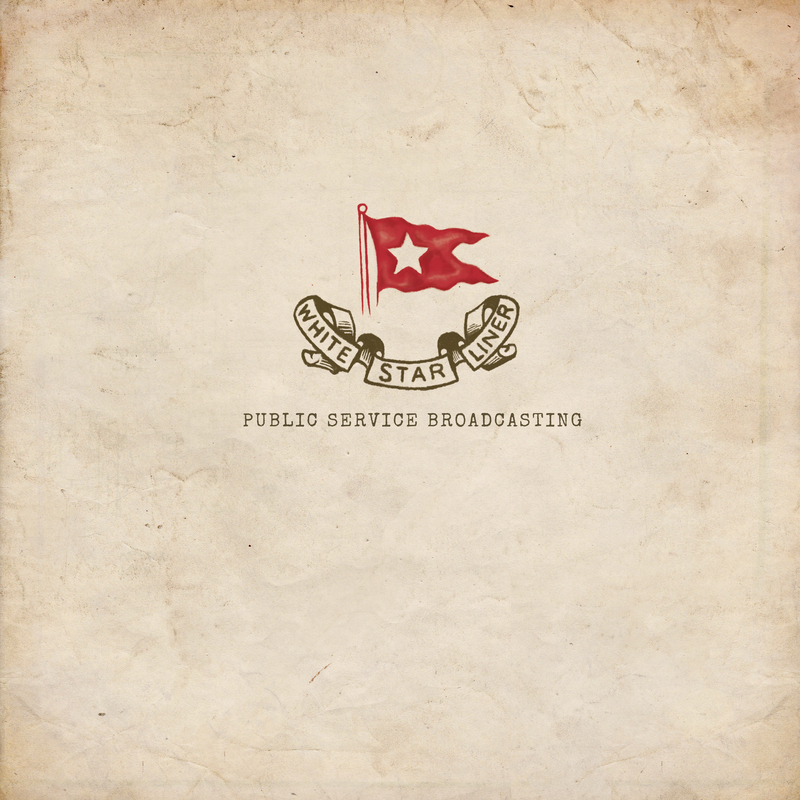 Offering a first look into what will be a four track EP due out next month, Public Service Broadcasting have released lead single, and EP namesake, “White Star Liner” this week. Though not the opening track of the extended play, it’s fitting that the anticipatory piece chosen for this new work be one steeped in the mentality of optimism and boasting a corresponding energetic musical counterpart. Knowing that the conclusion of the Titanic’s history is already a long foregone and somber conclusion, coming into a project that will revive the ship’s story feels less futile and despondent if begun at a point of firm, positive reminiscence, as the band has chosen here. “White Star Liner” is the narrative and emotional high point of the EP and is reflected as such by way of the jaunting, mind-tempo, clean but soft-toned guitar strum established by J. Willgoose Esq. at the forefront. While minimal, this opening only undergoes continuous bolstering as the track goes on. Observing the song as a whole, it ushers in an impression of subtle and very thoughtfully orchestrated mapping from beginning to end; coincidentally an impression that’s not unlike the idea of a ship mapping out its journey prior to departure. A decision, for example, as seemingly minor as having Wrigglesworth initiate the punch of his syncopated, see-sawing, kick and snare four-count pattern after the completion of an audio sampling that merely says, “It was time to go,” augments the imagery and mental association of a bigger, more powerful sound kicking in to really get momentum going, just like the larger engines on the Titanic. The fact that the song seems to somewhat tread in place once past the introduction and settling down of the track’s core elements and musical patterns might sound like a weakness on paper and even more so when taking note of the more than four-minute run time. However, just a slight shift in perspective can make all the difference. Consider that the focus of this chapter in the EP is the widely famed and highly praised departure of the Titanic. Then remember that the foundations of the voyage were tinted in excitement and thoughts of the ship as symbolizing human ingenuity, pride for the city of Belfast, promise for travelers seeking a new start, and a thing of engineering beauty and genius, the idea that the song’s musical supplement would adapt a sort of safely stable rhythmic and chord design makes plenty of sense. The ship, upon departing the dock, was always meant to have a smooth and pleasant journey across the Atlantic Ocean to New York City and a ship undisturbed would seemingly traverse open waters in a very predictable, planned, and well controlled way. Even as distorted but mildly choral style vocals fill pockets of the music between longer, more deliberate down beats about half way through the track, there never comes a point where “White Star Liner” even dares to give the appearance of being out of control or off its well established musical path up to that point. The pace changes from short and quicker to longer and slower but again, once could imagine that being like a parallel to the recurring shift of propeller speeds and the ship glides onward. The historically sampled dialogue in this first single is sparse; only launching the song forward after the introduction and leaving listeners to bask near the end, albeit however briefly for a decent remainder of the track, in the steady expansion of blended sounds each taking up parts of the dual legato and syncopated rhythmic motifs like many different people circling a neatly revolving door. Sustained synthesizer key tones, warm but gallant trumpet, and brief but snappy hand claps all mingle but manage to keep themselves and the song as a whole, feeling extremely organized, all the way to final 30 seconds of the end, which quiets things down, removes the frenetic syncopation, and almost signals in a way, that the ship has settled into a groove and can now calmly set off for the long journey ahead. By the time “White Star Liner” finally fades out and ends, it becomes a shame to think the dynamically peaceful, almost ambient outtro listeners are left with can’t just continue to last. “White Star Liner” is available now through iTunes, Amazon, and streaming on Spotify. The forthcoming EP of the same name is due out 26 October for CD and digital, 7 December on vinyl. Pre-orders are available now: CD / Vinyl.